The Murray-Darling basin has a highly variable climate and hydrological conditions often differ each year and across regions. Planning for this wet and dry is a major challenge for river operators, water resource managers and the community. Recent periods of extended drought, punctuated by widespread flooding have highlighted this challenge. We have seen new extremes in both drought and flood in many parts of the basin. Changes in rainfall patterns and warming temperatures leading to higher rates of evaporation, are adding to the intensity and impacts of both floods and droughts. These changes will continue to increase the complexities and uncertainties faced by water managers. The need to plan for drought has been understood since the early days of water management in Australia. 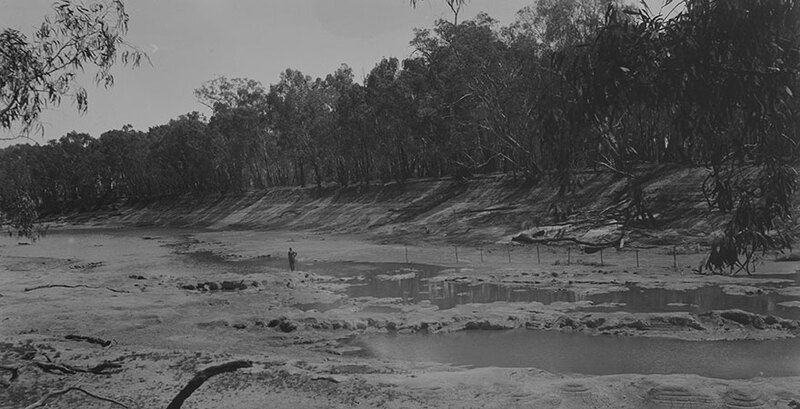 Before dams were built along the River Murray, dry times meant parts of the river and its tributaries would sometimes be reduced to a series of pools, or cease to flow at all. A man standing on the bed of the River Murray near Mildura during the 1901 drought. Photo by Henry Wilf. Image courtesy State Library of Victoria. These experiences highlighted the need to manage the Murray in a more cooperative manner and build the dams, weirs and other structures to provide a more reliable flow. The resultant 1914 water sharing agreement put in place between the Australian and state governments in 1915 enabled water to be allocated in a way aimed at securing supply for dry periods. The creation of the Snowy Hydro Scheme during the mid 20th century provided more water to communities by adding additional inflow to the River Murray system from outside the basin. The reliability of water from the Snowy River continues to be critical to water use in the Murray system particularly during drought. Over time, a series of water management reforms have not only reduced the impact of drought on communities and industry, but have also considered the water needs of a healthy river environment. Reforms include a cap on diversion, the introduction of water trade, allowing water owners to carry-over allocations from one year to the next and investment in more water-efficient irrigation. Many recent initiatives resulted from experiences during the millennium drought from 2001 to 2009. Foremost among them is the Murray–Darling Basin Plan, which rebalances water entitlements between consumers and the environment. It also includes tiers of water sharing arrangements and protects water for critical human needs. What does drought mean for the River Murray system? Predicting and even defining drought has presented another challenge. Drought conditions are caused by sustained periods of lower than normal rainfall, however, their nature and effect varies across the landscape and each drought is different from the last. In Australia, the Bureau of Meteorology has led the way in understanding drought and its causes. The concept of rainfall deficiency leading to acute water shortage is used by the bureau to define drought, and a better understanding of the climatic drivers of rainfall is improving predictions. However, in river systems, the nature and effects of drought are different. The amount of rain that ultimately flows into rivers and storages is heavily influenced by the pattern of rainfall over the year and across the landscape. River regulation and the moisture level across catchments are also critical. In a regulated river system with large headwater storages like the Murray, we get an acute water shortage when both storage levels and tributary inflows are low. A single dry year can impact landscapes and activities like dryland farming, but will have a limited impact on water availability if storage levels started out high. On the other hand, when long periods of below-average rain and low inflows fail to replenish storages, we see water shortages being felt across the landscape. When catchment conditions are dry, water recovery requires more than a single burst of heavy rain. Long periods of steady rain at particular times of the year are needed to wet the catchments. When the catchments are soaked, rain will generate run-off and return river flows to non-drought levels. Even then, storages may not be full until flooding rains arrive. The storage capacity of Dartmouth Dam is close to five years of average inflow, and even with flooding, it can take a few years to top up following a drought. When will the next drought begin? Is a new record dry period already starting? Despite improvements to climate forecasts, we still can't answer with certainty. Droughts tend to creep up gradually. Drought management is therefore about planning ahead, determining future needs and continually assessing risks. This means testing dry scenarios in our future planning and day-to-day computer modelling. This modelling helps us to understand the effect of inflows receding towards very dry conditions. We also only allow for improvements in water availability as they occur. Essentially we are planning for the possibility that the record drought starts tomorrow. We routinely manage the system to maximise water availability. This includes storing water as far upstream as practical to reduce evaporation and allow space for downstream storages to capture inflows. Our knowledge of the possible extent and intensity of drought is informed by looking at past events. We look at rainfall and flow patterns, long-term averages and historic highs and lows to predict future rainfall, stream flow and water storage levels. This approach is important to the planning process. However, few people would have expected the dry conditions at the peak of the millennium drought, when inflows fell to unprecedented levels of almost half previously recorded lows. The millennium drought indicated a trend that moves away from historical patterns and highlights the need for new ways of forecasting and managing droughts. River Murray operators are making greater use of the Bureau of Meteorology’s growing forecasting capabilities and the increased performance of climate and rainfall outlooks. Read our report on lessons learnt. At the same time, our operators are continuing to use common sense to anticipate and respond to dry periods. As weather and climate records continue to be broken, we are constantly reviewing and adjusting our assumptions around future inflows, evaporation losses and water demands. The occasions when very dry conditions result in severe effects have been infrequent. However, conditions similar or worse than those during the millennium drought and the severe dry of 1982-83 will occur again. Such extreme dry events trigger special management and operational responses to conserve remaining water supplies and limit the impacts that are otherwise unavoidable. Our responses include preserving water for critical human needs, reducing weir pool and flow target levels and changing state water sharing rules. Management plans are implemented in collaboration with state and Commonwealth governments and water management agencies. Most individual water entitlement holders are able to actively manage their own risk by using water trade and carryover where possible. Even with better forecasting, improved planning and new policies in place, we cannot drought-proof the system. Droughts may be more severe in the future and will continue to impact communities and the environment. The demand for water by all river users, and the need to conserve water means there will always be some tension in managing drought. By improving the way we plan and manage risk, river operators and water users can build the resilience and knowledge necessary to prepare and adapt for the conditions of the future.